I like the price, It is very cheap. It is functional and easy to use. If you are a large corporation aimed at marketing to a very large number of clients or want very specialized data you might want to check into a beefier system, but I think MailChimp is very usable for businesses and organizations of any size. I use MailChimp on a weekly basis to send out bulletins and information to church members. The free software really helps us connect with a large number of people easily and allows for them to reply to me directly without an abundance of other emails listed and contacted in the communication. It is simple to use and I would recommend checking it out if you send a weekly email or own an online or brick and mortar business with a need to contact groups of people efficiently. There are lots of integrations with database management software that makes it easier to connect with your clients, parishioners, members, buyers, friends, etc. Creating emails is simple and quick with MailChimp’s easy to use GUI. Check it out, especially since the regular subscription is free. I like the price, It is very cheap. It is functional and easy to use. If you are a large corporation aimed at marketing to a very large number of clients or want very specialized data you might want to check into a beefier system, but I think MailChimp is very usable for businesses and organizations of any size. I use MailChimp on a weekly basis to send out bulletins and information to church members. The free software really helps us connect with a large number of people easily and allows for them to reply to me directly without an abundance of other emails listed and contacted in the communication. It is simple to use and I would recommend checking it out if you send a weekly email or own an online or brick and mortar business with a need to contact groups of people efficiently. There are lots of integrations with database management software that makes it easier to connect with your clients, parishioners, members, buyers, friends, etc. Creating emails is simple and quick with MailChimp’s easy to use GUI. Check it out, especially since the regular subscription is free. Tools and interface easy to navigate…. Tools and interface easy to navigate. KB help docs incredibly comprehensive. SUPPORT IS INSANE. Live chat, email, talented support reps. Inexpensive compared to competition. Minor trigger issues — it’s not a 100% replacement for other services. Now that MailChimp has API hookup to Shopify, marketing automation is easy with a significantly less expensive alternative to Klaviyo. MC is incredibly powerful — but it does miss on some automation workflows — but since the support team is expert, they can usually find a solution or workaround. I experienced some “growing pains” after migrating my lists in – and since the Shopify API is relatively new, there were some minor mishaps — but overall I am thrilled with the tools and the deliverability. Tools and interface easy to navigate. KB help docs incredibly comprehensive. SUPPORT IS INSANE. Live chat, email, talented support reps.
Minor trigger issues — it’s not a 100% replacement for other services. Now that MailChimp has API hookup to Shopify, marketing automation is easy with a significantly less expensive alternative to Klaviyo. MC is incredibly powerful — but it does miss on some automation workflows — but since the support team is expert, they can usually find a solution or workaround. 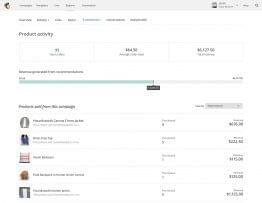 I experienced some “growing pains” after migrating my lists in – and since the Shopify API is relatively new, there were some minor mishaps — but overall I am thrilled with the tools and the deliverability. Its easy to use and it brand name is well known It is expensive. It doesn’t have features such as fast and easy to use integration to websites It doesn’t have the ability to resend campaigns to unopened emails automatically 7 days after the original sent. or the ability to track the opening times and have each email delivered into the recipients email box at the time they are most likely to open it. The service is shocking and the staff rude – and they don’t like to talk on the phone, so you have to wait for an email reply. its much more expensive than its competitors and it hasn’t got as many useful fractures as other sites. i have used it in 3 different companies now and all three times have found that is is much easier than so many of its competitors that companies assume that its the best, but when they experience Robly they realize just how many functions and features MailChimp is lacking. It is easy to use but is also over priced. Don’t use it. the service is shocking and honestly its competitor, Robly, is 100% better in every way. The usability, the set up of mailing lists, the integration with your website, the different sending features and the price is far superior in every way. My advice would be to look into the features that other sites have to offer before just going with Mailchimp. It doesn’t have the ability to resend campaigns to unopened emails automatically 7 days after the original sent. or the ability to track the opening times and have each email delivered into the recipients email box at the time they are most likely to open it. The service is shocking and the staff rude – and they don’t like to talk on the phone, so you have to wait for an email reply. its much more expensive than its competitors and it hasn’t got as many useful fractures as other sites. i have used it in 3 different companies now and all three times have found that is is much easier than so many of its competitors that companies assume that its the best, but when they experience Robly they realize just how many functions and features MailChimp is lacking. It is easy to use but is also over priced. Don’t use it. the service is shocking and honestly its competitor, Robly, is 100% better in every way. The usability, the set up of mailing lists, the integration with your website, the different sending features and the price is far superior in every way. My advice would be to look into the features that other sites have to offer before just going with Mailchimp. I¿ve been using MailChimp for a year, along with other email marketing software¿s, and MailChimp is one of the best email marketing softwares in the market. I am not a fan of the customer support system, I¿ve had to contact the customer support twice, each on different accounts. On first was on a paid account and the customer support rep was very helpful, the second was on a free account and I¿m still waiting for their response. I hope they get back to me because it¿s still within the 30 days of support. One of the reasons I don¿t like this system is because the brands I work with are mostly startup or small businesses and most of them have heard of MailChimp and they know it¿s free for 2000 subscribers, however, they don¿t know what restrictions the free plan comes with. And their suggestion to everything is ¿Contact customer support¿ If only they knew ¿ I also wish the free plan came with a bit of automation but I guess what is what Drip or SendinBlue is for. I also wish MailChimp came with an inbuilt mini tutorial on how to use their software, I think people new to email marketing would find it very useful. I remember the first time I tried MailChimp I had no idea that I had to create a template and then a campaign. I use MailChimp with a lot of integrations to widen its use, I use MailChimp with Privy, Drip, Hubspot CRM and many other tools thanks to Zapier. One of the features I love about MailChimp and I¿m yet to find in SendinBlue or Benchmark email is the ability to have an image header in the signup form. My review is mostly based on the free plan, but despite the flaws I¿d still recommend MailChimp to individuals and companies looking to get into email marketing. Mailchimp is easy, it is also the go-to email marketing software for small businesses and bloggers. It is easy to use, the signup form allows more customization options than most email marketing softwareS. The free plan allows 2000 subscribers. The templates compared to other Softwares like SendinBlue, Active Hosted, Mailpoet, and Benchmark is a bit basic. The free plan while great has so many restrictions, the areas I’m concerned about are support and automation which the free plan doesn’t deliver when compared to SendinBlue Mailchimp is a great email marketing solution for beginners, the interface is clean and there are less chances of being overwhelmed. The free plan is great for bloggers or those who want to start focusing on building their list. As your skill increases you would need to upgrade or try a different Email marketing software because the free plan doesn’t come with several important features. I¿ve been using MailChimp for a year, along with other email marketing software¿s, and MailChimp is one of the best email marketing softwares in the market. I am not a fan of the customer support system, I¿ve had to contact the customer support twice, each on different accounts. On first was on a paid account and the customer support rep was very helpful, the second was on a free account and I¿m still waiting for their response. I hope they get back to me because it¿s still within the 30 days of support. One of the reasons I don¿t like this system is because the brands I work with are mostly startup or small businesses and most of them have heard of MailChimp and they know it¿s free for 2000 subscribers, however, they don¿t know what restrictions the free plan comes with. And their suggestion to everything is ¿Contact customer support¿ If only they knew ¿ I also wish the free plan came with a bit of automation but I guess what is what Drip or SendinBlue is for. I also wish MailChimp came with an inbuilt mini tutorial on how to use their software, I think people new to email marketing would find it very useful. I remember the first time I tried MailChimp I had no idea that I had to create a template and then a campaign. I use MailChimp with a lot of integrations to widen its use, I use MailChimp with Privy, Drip, Hubspot CRM and many other tools thanks to Zapier. One of the features I love about MailChimp and I¿m yet to find in SendinBlue or Benchmark email is the ability to have an image header in the signup form. My review is mostly based on the free plan, but despite the flaws I¿d still recommend MailChimp to individuals and companies looking to get into email marketing. Mailchimp is a great email marketing solution for beginners, the interface is clean and there are less chances of being overwhelmed. The free plan is great for bloggers or those who want to start focusing on building their list. As your skill increases you would need to upgrade or try a different Email marketing software because the free plan doesn’t come with several important features. They offer the free version that is simple enough to collect e-mail addresses through your website and deliver content like lead magnets. I also like the e-mail templates – they make the content creation easy. Cons:I have had a little trouble with customizing the embedded forms for my website, but definitely not a deal breaker. I can adjust my website to accommodate the forms. I have used Mail Chimp for a couple different businesses and appreciate the simplicity of programming. My favorite part is that I can collect e-mail addresses through my website and create automated e-mails to deliver content at any time of day or night – hands free. While I am sure that more powerful solutions exist that integrate customer management with mailing lists, mail chimp’s free version is a great place to start for startups or bootstrapping businesses or blogs (if you are ok with the mail chimp logo being in your e-mail). Overall I’ve been very pleased with the functionality mail chimp for managing my mail lists and drip e-mail chains. I would definitely recommend the free version for basic list management/subscription management and the paid version for more powerful features (like the drip e-mails). They offer the free version that is simple enough to collect e-mail addresses through your website and deliver content like lead magnets. 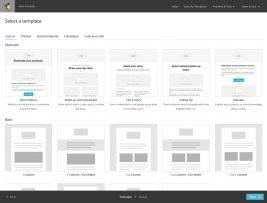 I also like the e-mail templates – they make the content creation easy. Cons:I have had a little trouble with customizing the embedded forms for my website, but definitely not a deal breaker. I can adjust my website to accommodate the forms. I have used Mail Chimp for a couple different businesses and appreciate the simplicity of programming. My favorite part is that I can collect e-mail addresses through my website and create automated e-mails to deliver content at any time of day or night – hands free. While I am sure that more powerful solutions exist that integrate customer management with mailing lists, mail chimp’s free version is a great place to start for startups or bootstrapping businesses or blogs (if you are ok with the mail chimp logo being in your e-mail). Overall I’ve been very pleased with the functionality mail chimp for managing my mail lists and drip e-mail chains. I would definitely recommend the free version for basic list management/subscription management and the paid version for more powerful features (like the drip e-mails). MailChimp was founded in 2001 by Ben Chestnut and Dan Kurzius. It began as a paid service for its first 8 years and introduced a freemium version in 2009. Today, MailChimp is used by over 16 million people and businesses worldwide and employs over 700 people. It sends over 10 billion emails per month on behalf of its users. MailChimp remains privately-held. MailChimp partners with non-profit organizations to promote community growth in its hometown of Atlanta. It offers MBA-style courses, apprenticeship programs, and other education opportunities to its employees. In 2016, MailChimp was ranked No. 7 on Forbes’ Cloud 100 list. 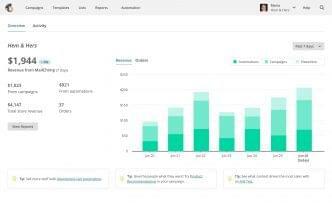 MailChimp offers a freemium version and two subscription tiers, titled New Business, Growing Business, and Pro Marketer, respectively. Each successive subscription offers escalating functionality. Paid subscriptions offer monthly billing or pay-as-you-go plans; monthly pricing escalates according to number of subscribers. The Pro Marketer plan adds a flat monthly fee of $199. 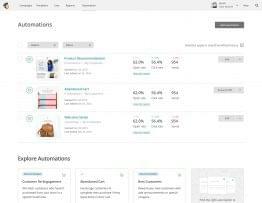 MailChimp is one of the more popular marketing automation platforms businesses will use. Their services cover a wide range of businesses, from large to small. Their pricing plans are well-balanced to MailChimp uses integrations, automation tools, and customizable email templates to make sending emails and promoting products easier. MailChimp’s unique email designer and custom templates are one of the main features highlighted on their website, and for good reason. 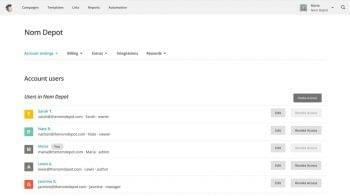 The email designer features a drag-and-drop feature that allows for users to fine-tune exactly where they want uploaded pictures and text to go. Pictures can also be edited and resized to fit the user’s needs. Fonts and color palates are also customizable, which come in handy for specific calls to action. Each tool is broken down in easy-to-understand and accessible buttons. The custom templates can be customized based on the message a business is trying to send. For example, if a business is trying to showcase a new product with limited text, there’s a template made for bigger pictures, centered and in full focus. These templates, combined with their user-friendly designer tools, make MailChimp more accessible than other marketing automation providers. Each pricing plan is specifically designed for all businesses, making MailChimp an all-around, affordable marketing automation provider. They have three reasonable price plans which are also customizable depending on the number of subscribers your business has/projects to have. They’re laid out nicely on their website, which makes it easy for business owners to decide what they can afford. MailChimp’s success appears to lie in its out-in-the-open, user-friendly, customizable features, pricing plans, and design tools. MailChimp’s integrations with social media make it an ideal option for businesses who haven’t yet taken the leap into online marketing, or for businesses who wish to simplify their marketing process. Overall, MailChimp is one of the most, if not the most, recognized marketing automation providers for good reason. They want businesses to know that their services come with no hidden fees, there are no significant gaps in features included between pricing plans, and anyone is capable of using MailChimp regardless of how tech-savy you are or aren’t. MailChimp should be considered for businesses of all types and sizes. What Do You Think of MailChimp?